Review: Dory is a friendly and forgetful blue tank fish who goes on a long quest to find her lost parents. Everyone starts realizing the real meaning of family. I really enjoyed the first half of this and then just found it got ridiculous and felt it had somewhat lost the main plot of the film. I started looking at my watch wondering how much longer there was to go. Even though the certificate for this film is U there are still quite a lot of jokes that are lost on the children and that only adults will only get. It doesn’t have the same excitement that Finding Nemo (2003) had. Apparently Pixar have been criticized for continually doing sequels e.g. Toy Story. Most of the cast return except for the young Nemo, as Alexander Gould has outgrown his role (would now be aged 22). Hayden Rolence took over the role. It is a very entertaining and colourful film but the problem is that we have seen it all before so therefore there is nothing new. I did enjoy the musical score especially with all the scenes when Dory was underwater. This is the third Pixar film to have a lead female role. The other two being Brave (2012) and Inside Out (2015). Despite it being called Finding Dory it is actually her parents that they are trying to find. 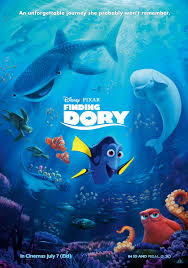 Most of this film is about Dory’s short-term memory loss, not remembering anything.